NASA's Mars Reconnaissance Orbiter has caught Mars in the act of geological change! Recent images recieved from the orbiting camera station show a large avalanche on February 19, 2008. The dust cloud seen in the image below is about 590 feet (180 meters) across and 625 feet (190 meters) long. This is actually one of four such landslide seen in one larger photo, available here. The 2,300 foot (700 meters) cliff seen in this image is part of the raised section that comprises Mars' northern polar region. The ice on the west side of the image is part of Mars' polar ice cap, a frozen deposit of carbon dioxide and water ice. 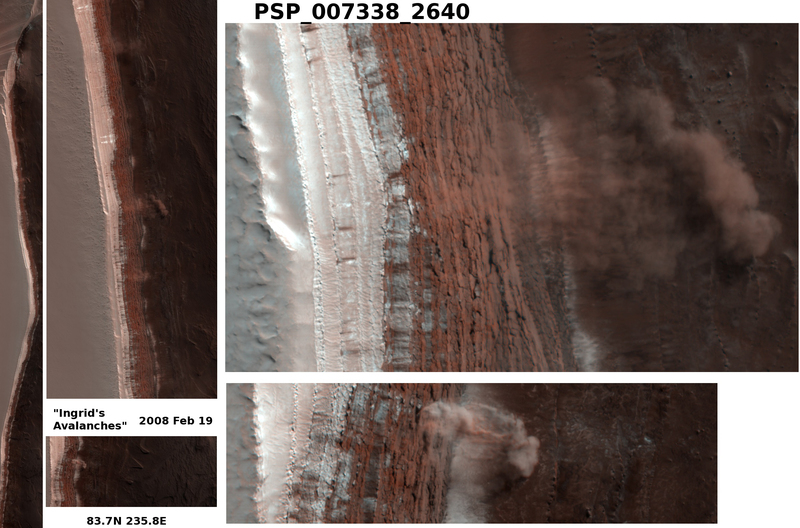 Many of the images obtained by the Mars Reconnaissance Orbiter show seasonal and small-scale changes, such as dust devils. This, however, is the first image of large-scale change in progress, a rare sight indeed. While the mechanism responsible for the collapse are as of yet unknown, several causes have been proposed. It could have been a "Mars-quake", or a small meteorite impact. It also appears that sections of the upper cliff face have been cracked and eroded by the timely expansion and contraction of the polar ice cap. 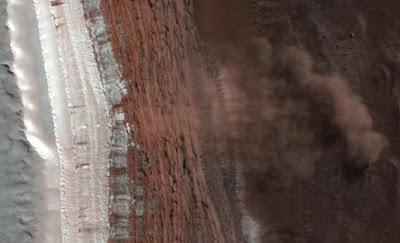 These weakened sections of the cliff face could be dislodged by gravity or Martian winds. Information gathered from these images could help planetary geologists piece together one more aspect of Mars' mysterious geological history. This particular has a tendency to of times be truly helpful for a number of your own jobs We plan to really do not just along with my personal weblog you can now follow-up Cash Advance Many thanks a great deal with regard to good info.